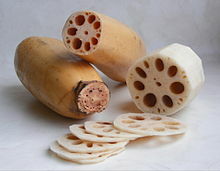 This article is about the botanical term. For other uses of the word, see rhizome (disambiguation). In botany and dendrology, a rhizome (/ˈraɪzoʊm/, from Ancient Greek: rhízōma "mass of roots", from rhizóō "cause to strike root") is a modified subterranean plant stem that sends out roots and shoots from its nodes. Rhizomes are also called creeping rootstalks or just rootstalks. Rhizomes develop from axillary buds and grow horizontally. 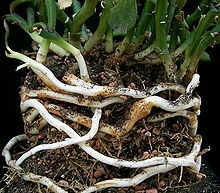 The rhizome also retains the ability to allow new shoots to grow upwards. 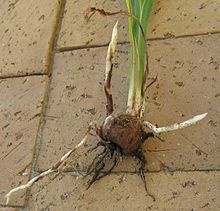 A rhizome is the main stem of the plant. A stolon is similar to a rhizome, but a stolon sprouts from an existing stem, has long internodes, and generates new shoots at the end, such as in the strawberry plant. In general, rhizomes have short internodes, send out roots from the bottom of the nodes, and generate new upward-growing shoots from the top of the nodes. Some plants have rhizomes that grow above ground or that lie at the soil surface, including some Iris species, and ferns, whose spreading stems are rhizomes. Plants with underground rhizomes include gingers, bamboo, the Venus flytrap, Chinese lantern, western poison-oak, hops, and Alstroemeria, and the weeds Johnson grass, Bermuda grass, and purple nut sedge. Rhizomes generally form a single layer, but in giant horsetails, can be multi-tiered. Many rhizomes have culinary value, and some, such as zhe'ergen, are commonly consumed raw. ^ a b Jang, Cheol Seong; et al. (2006). "Functional classification, genomic organization, putatively cis-acting regulatory elements, and relationship to quantitative trait loci, of sorghum genes with rhizome-enriched expression". Plant Physiology. 142 (3): 1148–1159. doi:10.1104/pp.106.082891. PMC 1630734. PMID 16998090. ^ Stern, Kingsley R. (2002). Introductory Plant Biology (10th ed.). McGraw Hill. ISBN 0-07-290941-2. ^ Nayak, Sanghamitra; Naik, Pradeep Kumar (2006). "Factors effecting in vitro microrhizome formation and growth in Curcuma longa L. and improved field performance of micropropagated plants". Science Asia. 32: 31–37. doi:10.2306/scienceasia1513-1874.2006.32.031. ^ Rayirath, Usha P; et al. (2011). "Role of ethylene and jasmonic acid on rhizome induction and growth in rhubarb (Rheum rhabarbarum L.)". Plant Cell Tissue Organ Culture. 105: 253–263. doi:10.1007/s11240-010-9861-y. ^ Hogan, C. Michael (2008). Stromberg, Nicklas (ed.). "Western Poison-oak (Toxicodendron diversilobum)". GlobalTwitcher. Archived from the original on 2009-07-21. ^ Husby, C. (2003). "Ecology and Physiology of the Giant Horsetails". Florida International University. Archived from the original on 2009-07-14. ^ Lim, T.K. (2016). Edible Medicinal and Non-Medicinal Plants (11th ed.). Springer. ISBN 978-3-319-26061-7.